Rearview Town opens with Dirt to Dust, where Aldean’s instantly recognisable tone is assisted with the upbeat support of guitars and drums to draw the listener in. Set It Off is the moment a kiss changes everything – turns an ordinary night into a night like this. The tempo doesn’t slow as Girl Like You is exactly what you’d expect from the title – wondering how you’ve never met someone that gets your attention so quickly. You Make It Easy was released as the first single from the album at the end of January and is the first track to slow things down a little. In the track that has writing credits for Tyler Hubbard and Bryan Kelley of Florida Georgia Line Aldean sends out the statement how it is so easy to love someone when they are the one for you. The pace doesn’t slow down for long on this album and the “Let’s go” opening of Gettin Warmed Up gives that away. The country rock lyrics give a sign of things to come as Aldean wants everyone to join the party which shows no sign of stopping. Just to show he hasn’t lost his roots there’s even a rap interlude for fans to learn! If you were hoping to get your breath back after showing off your rap skills think again. Blacktop Gone continues with the get out of town song to be free and chase the sun – Aldean had better get used to have Blacktop Gone back to him! When you are the reigning Entertainer of the Year it’s not going to be too hard to persuade other artists to feature on your album. Right now, in Country Music they don’t come much bigger than the eight-time Female Vocalist of the Year Miranda Lambert. Having appeared together on Aldeans 2007 Relentless album Lambert returns to offer vocals to Drowns The Whiskey. Aldean said in an interview that after sending Lambert the track she flipped out and nailed it when she sang it. The track offers a more traditional country feel than tracks on the album so far as they tell the tale of having a whiskey or two to forget life’s problems. The native of Macon, Georgia tells the runaway tale in the title track Rearview Town. Growing up you think you will never leave your home town but Aldean looks to the negatives of staying put when there’s a whole world out there to explore. Love Me or Don’t is the tired of an on/off again relationship track as you reach a crossroads before heading down memory lane and reminiscing about a past love from younger years in Like You Were Mine. Better at Being Who I Am slows things down as Aldean tells the listener to not try and be someone you aren’t – I’m better at being on my side of town. As with previous tracks the energy goes back to ten pretty quick and I’ll Wait For You does that. It doesn’t matter how far you are away from each other because if you know its love you won’t go anywhere and you’ll wait for them. Ride All Night continues where I’ll Wait For You left off (both recorded after the October shooting) as you want to just drive round all night with your love. Despite releasing a new album himself last week, David Lee Murphy found time to add a co-writing credit to the rock anthem Up In Smoke before the album closes with the track that shares the name of his current tour – High Noon Neon. The track tells the story of the bar being cleaned up after the night before with the stray car in the car park and the empty glass on the bar. 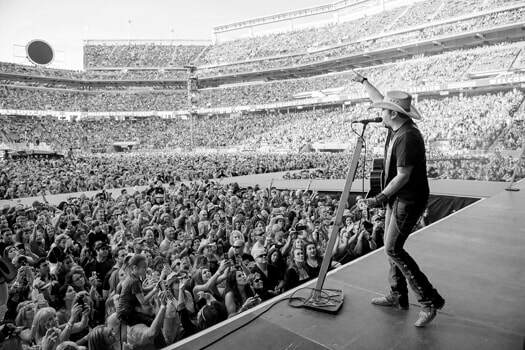 Aldean has certainly gone for a high energy album with Rearview Town by offering a mix of country grooves, stadium anthems and of course a bit of rap, which is sure to keep is fans happy. There is no reason why Aldean won’t be getting yet another number one album on the Billboard 200 chart following this release and yet again has shown why he is regarded as one of the best entertainers that the country music genre has to offer.